Global governance is fast becoming a ubiquitous phrase, succeeding globalization as the latest buzz term. But exactly what does it mean? For many scholars and policymakers the term captures important aspects of world politics. This unique volume delivers and compares the key perspectives of the leading thinkers in the area, equipping the reader with an excellent understanding of the debate now defining and mapping the future of this term. This comparative approach is underpinned by a lucid theoretical framework which guides the reader towards building a clear sense of the debate and its complexities. A wide range of empirical issues are covered, including those of Security, International Political Economy, Environment, Human Rights, Social Movements and Regulation. 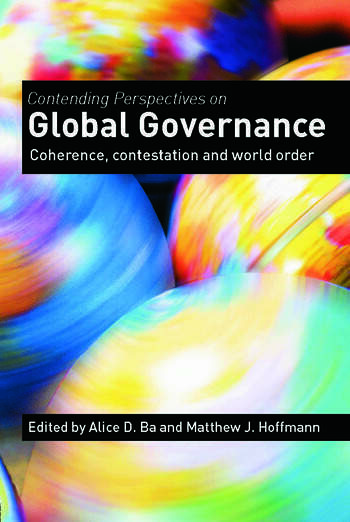 Including theorists of social constructivism, liberal imperialism and realism, this is an essential book for students and scholars which stimulates discussion and presents a fully rounded picture of global governance.